Military Situation In Area Of Deir Hafer In Syrian Province Of Aleppo On March 23, 2017 5 out of 5 based on 7 ratings. 7 user reviews. The Syrian army’s Tiger Forces, backed up by warplanes, further advanced against ISIS terrorists near the ISIS-held city of Deir Hafer in the province of Aleppo. Government troops captured Um Adsa, Al-Khalilah, Jafr Mansour, Tell Akoulah, al-Qasr and Lalat Muhammad. They cut off the Deir Hafer-Raqqah road and de-facto encircled the ISIS stronghold. Some ISIS units are still able to flee Deir Hafer via the cross-country northeast of the city, but this is a temporary option. ISIS reportedly has about 400 fighters in the area. DON’T LET THEM FLEE! Destroying as many terrorists as possible should be a higher priority, than “assuming control” of a few districts of burnt-out rubble a couple of days sooner. I hope Syria does not make a gain some type of pact or agreement where ISIS can be put in anothe place and leave the city. They must be exterminated, otherwise constant suicide bomb attack will appear everywhere in Syria, as it is already happening because the Syria left the terrorists in Allepo and other cities in freedom. Not agreement, no pact just finish your job with these terrorists. I know war is a tough Dude. Easy to watch from side but tough in the middle of it. 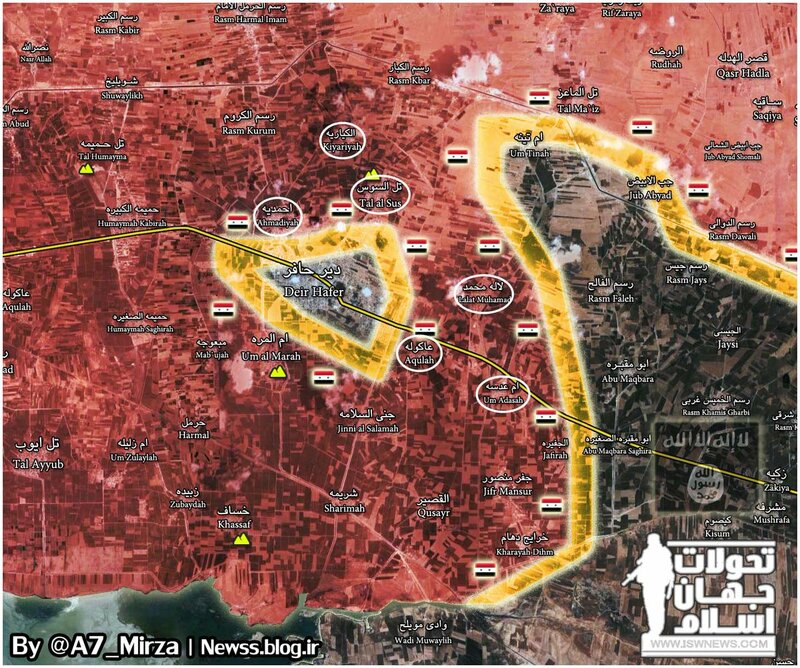 However, I can’t marvel enough at how the Jihadists and other blood-sucking bastards manage to capture vast swath of land – towns and villages in a matter of days and SAA takes days and weeks to get them back with great losses. What the Hell is going on?